12:30 Assemble at Trinity Park, Queen Street West. Route - Queen and Dufferin Streets to the Exhibition grounds. Nursing Sister Madeline F. Jaffray and Private Richardson, V.C. Blind from Pearson Hall, Euclid Hall and special disability cases from hospitals with nursing sisters in charge. Assistant matrons and nursing sisters in uniform. Massed silk banners and flags of veteran organizations. Veterans of the Great War in companies of 200. 2.00 p.m. - Arrival at grounds and review by Lord Byng. Private George Richardson, V.C. won the Victoria Cross on April 27, 1859 while fighting with the Border Regiment of the British Army in northern India. An Irishman by birth, Richardson came to Canada in the early 1860s. In 1921, at the age of 90, he was the oldest living VC recipient in the British Empire. Nursing Sister Madeline S. Jaffray received nine medals and decorations during WWI including the French Croix de Guerre, the French Distinguished Service Medal, the American Service Medal, the French Nursing Medallion, the American National Medallion, the French wound stripes, the General Service Medal, and the Victory Medal. She was also recommended for the French Legion of Honor and the Medallion Militaire. She lost her left foot under German shell fire at Dunkirk. Both were honoured guests of the Canadian National Exhibition on the first Warriors’ Day in 1921 and sat side by side in a carriage at the head of the parade. In the preceeding week, Toronto’s newspapers published notices for veterans to form up on parade day at 12:30 noon in Trinity Park (Strachan avenue and Queen street) as Toronto anticipated the biggest and busiest opening CNE day in its’ 43 years’ history. The Massey Harris Company provided free lunches for more than 500 veterans in their cafeteria before the parade began. The gathering throng of veterans at Trinity Park quickly became a huge social occasion with the reunion of friends who had not seen each other for years. Thoughts of friends killed and injured on the battlefield entered conversations over and over. Thousands of spectators gathered along Queen Street and Dufferin Street to witness this incredible spectacle a parade route much different from our modern day parades. The parade would enter the CNE grounds through the Dufferin Gates. 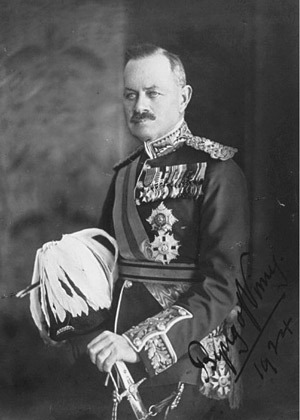 Canada’s new Governor General, Lord Byng of Vimy was invited that year to officially open the CNE. Lord Byng took the salute as the 15,000 marchers proudly passed by the saluting dais just south of the Dufferin Gates. Lord Byng was well known and loved by the troops, having led the Canadian Army to victory at Vimy in 1917, an event that would change Canada forever. At the conclusion of the parade, everyone gathered around the main band stand in front of the Horticultural Building where Lord Byng addressed the huge number of spectators and veterans by speaking through a “Magnavox” amplifier. “I feel that it is my first duty to thank you for extending to me the invitation which has brought me here to-day. I received it within a very few days of my appointment to be Governor-General and it gave me the greatest pleasure to seize such an opportunity for my first visit to Toronto. “On first assuming office, I have found in the multitude of new activities of this great dominion, many which I have known very little about, but, ladies and gentlemen, your exhibition did not come within this category. Without exaggeration it can be said that the Canadian National Exhibition is famous throughout the British Empire, and the continent of America, and when I look at this splendid site, stately buildings and excellent organization, I feel that this reputation is well deserved. “I cannot express in words to you, my comrades of the war, my gratitude for the warm welcome you have given me today. It has been a happiness that I shall not easily forget, and I see before me during my term of office many days amongst old friends. “Watching you parade I could not help drawing a comparison in my mind between the times when we had met before and the present occasion, I cannot imagine a greater contrast than you will find here. War, however just, however necessary, is destruction of the past efforts of civilization, and the mortgaging of the inheritance of its future generations. That the war we have just passed through was just, was necessary, was in defence of our ideals and our liberties, no one, I think, will deny. We have won it and kept our freedom, but we have to pay the price just the same. "But to-day we are celebrating the opening of an exposition of every branch of man’s constructive genius. We see around us his inventions to bring all the resources of nature under his command for the betterment of mankind and the improvement of our civilization. In fact, this Exhibition teaches us through increased and more efficient production how the effect of four and a half years’ destruction can best be eradicated. If we are to gain the full benefits from the recent struggle through which we have just passed, the nations of the world must try to read its lessons. "Commerce is the basis of all international relationship, and it is obvious that a national exhibition of a country, products both agricultural and manufactural such as we see here to-day, visited by people almost every part of the world, must materially assist in promoting international trade and a better understanding each of the other’s requirements and aspirations.
" You of the province of Ontario may well be proud of your great annual festival. Every man will find here a true picture of what Canada is doing towards the development of the great inheritance which is here, and an inspiration to stick true to the ideas of the succeeding generations of her citizens, who have built up in less than a century since the incorporation of Toronto as capital, a city worthy of this great position in a great province and true to the meaning of its name, a place of meeting." Following Lord Byng's address, a solemn and impressive ceremony took place. More than 100 women and ex-service men of the G.W.V.A. had worked for three months on the hand sewing of a set of silk colours which were designed by Sergeant Raper, a veteran of Mons, who saw three years of service in the Great War and was seriously wounded. Named the Toronto and York County Great War Veterans Association Colours, they bore the crests of city and county with the G.W.V.A. in the centre, surrounded by maple leafs, in wreath form, all in natural colors. On top of the pole was a little gold beaver and a silver log, emblematic of Canada. The colours were consecrated that day by Canon Frederick George Scott, beloved Padre of the First Division. At a service which took place on June 30th, 1922, these colours were placed on General Wolfe's monument inside Westminster Abbey in London, England where they remain to this day. The colours were placed there to commemorate ties formed between the Imperial and Canadian service men overseas. Their arrival in London was made an impressive event, the ceremony included a guard of honor and a parade to the Abbey by Imperial troops and Canadian ex-service men. To bring the first Warriors' Day to a conclusion, that evening a special performance arranged by the veterans in honor of Lord Byng took place at the C.N.E. Grandstand. The performances included a massed band concert, dances, a naval gun display by the Naval Veteran’s Association, exhibitions of boxing by ex-service men, Victoria Cross race where a body of men rescue a wounded soldier in front of the enemy and carry him back to safety, community singing, and an Empire tableau, which proved to be exceptionally impressive. The general idea was to convey to the the immensity and greatness of the British Empire.